Rather than analyze new releases song by song, we offer 'overviews' designed to give you a better idea of how likely you are to like the album as a whole. Click on the cover art to hook up with more reviews. And Listen for yourself. Sample songs from the release through the player below the review. Another in the seemingly endless supply of solid bands based in Austin, this group is one that deserves the favorable comparisons it gets to The Band, Little Feat, the Black Crowes and other fine bands. Those reflect the obvious connection the band has with its material, as opposed to suggesting TBOH is directly derivative of any group. With three outstanding writers, the band draws on a wealth of original material that makes it clear this is a group that can make a lasting impact on American Rock. There's nothing fancy or flashy going on here - just genuine musical talent and great song writing. Colin Brooks of the band says they are comfortable being in a mode that was more common in the late 60's and early 70's when " the music was what drove the wheel, not the tabloid pop-star personality". Amen to that! 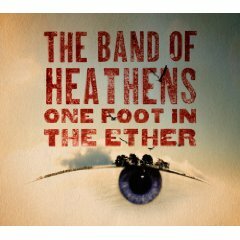 The Band Of Heathens is the real deal, and the songs on this, the band's 4th album to date and second studio release, show the band has come into its own - and make One Foot In The Ether an album well worth owning.